"Dr. Crackower is a very intelligent doctor and I trust his opinion." "Dr. Crackower's staff is amazing. He is one of the best doctors in Louisiana." "Dr. Crackower is a highly knowledgeable doctor who catches things other doctors miss." 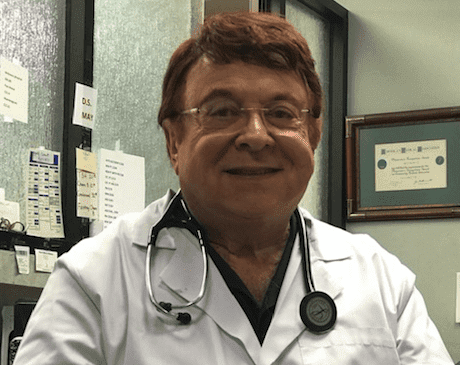 Sydney Crackower, MD is a board-certified family medicine physician who has been providing expert medical care to the families of Lafayette, Louisiana, for more than 40 years. Each patient that comes to the office, including children, adults, and elderly, receives personalized care and attention from Dr. Crackower and his staff, building on trust and the patient-doctor relationship. Dr. Crackower is trained to meet the diverse health needs of people of all ages from child to adulthood. He specializes in the management of chronic health conditions such as high blood pressure and diabetes, as well as providing expert care for patients suffering from chronic pain, depression, and anxiety. Dr. Crackower focuses on patient wellness and also offers medical weight loss for those struggling to drop unwanted pounds. To his patients, Dr. Crackower is known as a no-nonsense doctor. He will identify the source of the illness and work at finding a cure to relieve symptoms. He also manages unexpected illnesses, such as sinusitis and sore throats, and has same-day appointments available for urgent medical needs. Dr. Crackower also offers laser hair removal. Dr. Crackower received his medical degree from the University of Western Ontario, London Ontario Canada, and then entered his residency at LSU Health Sciences Center New Orleans. He is a diplomate of the American College of Pain Management, and affiliated with both Lafayette and Abbeville General Hospitals. These are some of the insurances we accept. We work with most other commercial medical insurances. Contact our office to confirm if your plan is in our network. "Dr. Crackower has been my doctor for 7 years and has rendered fabulous medical assistance. He is a no nonsense doctor. If something is really wrong, he's the one ." "Dr. Crackower is a very kind, and caring physician. He will take the time to explain medications and conditions in detail, and in a simple to understand manner." "I've been Dr. Crackower's patient for over 30 years. He is very knowledgeable. He correctly diagnosed me when others didn’t. He listens and answers my questions."